What’s the use of a deck without some of the best decking accessories for fall? After all, autumn is one of the best times to get out there and enjoy your deck. The summer’s searing heat is gone, and the winter chill hasn’t yet arrived. Autumn deck entertaining is a great way to squeeze every last drop of enjoyment out of your deck before the cold comes. Successful outdoor entertaining requires some basic furnishings and creature comforts. A folding table and some camp chairs could do the job. Or, you can go next level and create a cozy outdoor oasis for three-season enjoyment. As your trusted deck experts at Wahoo Decks, we are happy to use our years of experience to help you achieve top deck status. 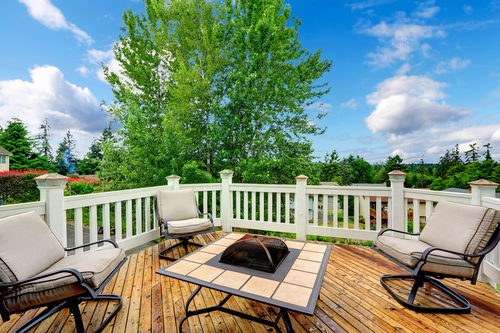 Deck furniture is available in a wide range of materials, colors, and styles. You can buy good quality pieces at any price point. Choose furniture that fulfills your needs and provides a comfortable seating area. Nobody wants to spend a whole party sitting on a wooden bench seat, so make sure you have enough cushions to go around. Toss a few throw blankets over your deck chairs for an added touch of comfort for your guests. Sometimes you just need to cut the autumn chill a little. A fire pit achieves that and helps set a cozy, peaceful mood for your outdoor gathering. Go with a gas fire pit to maintain constant control over the flame. Or choose a wood burning fire pit for the best s’more spot on the block. Fire pits are also available in many different sizes and styles. There is the perfect fire pit out there for every deck setup. Most families find they can never have too much storage. You need a convenient place to keep your deck accessories, citronella candles, and other outdoor entertaining supplies. An attractive deck box performs that duty and can also double as a bench seat. Most full deck furniture sets offer coordinating deck boxes, so you should be able to find one that matches your seating and tables. When a fire pit isn’t feasible or just won’t get the job done, a patio heater will keep your crew toasty outside. Everyone has that one friend who can never get warm enough. Gas-powered heating towers throw a good ring of warmth around them, and one propane canister will last for hours. Plus, you might not believe how affordable patio heaters are. In the winter, just store it in a corner of your garage. What Are Your Favorite Decking Accessories for Fall? Comfortable furniture, a heat source, and some good eats are all you need for a great deck party. We hope our list of our favorite decking accessories for fall will help you elevate your next outdoor gathering. If you need more help to make your deck a place to enjoy, get in touch with our team at Wahoo Decks today.